THE SHERIFF for Shetland and Orkney has apologised for delays in court proceedings caused by “budget restraint” at the Scottish Court Service (SCS). Sheriff Mann was forced to delay four trials at Lerwick Sheriff Court which were due to be heard in March, because there will be no sheriff available to hear them while he is away on annual leave. The sheriff went on holiday this week and is not due back in court until mid March, forcing trials set for 5 March to be put back by one month. The SCS is sending one part time sheriff to Lerwick on 4 March to hear any cases that need to be dealt with over the next six weeks. 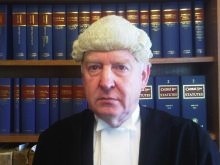 Speaking in Lerwick Sheriff Court last week, Sheriff Mann said: “On 5 March I will be on leave and due to budget constraints by the Scottish Court Service there will be no court cover. On Tuesday a spokeswoman for the Judicial Office for Scotland said the Sheriff Principal had discussed the matter with the local sheriff and decided there were only enough cases to merit a single day of hearings. She said: “The Sheriff Principal is responsible for the efficient disposal of business within the sheriffdom and in discussion with the sitting sheriff, Sheriff Philip Mann, has determined that the level of business identified for Shetland (sic) Sheriff Court, during the Sheriff’s three week period of leave merited one programmed sitting day to be covered by a part time sheriff.